It is a thrill to catch the interplay of Jupiter's rotation, the motions of its moons, and a shadow racing across the Jovian cloud tops! Io transiting Jupiter with Europa swinging around in the background. Derived from over 25,000 images taken over the course of nearly 2 hours, from Madison, Alabama, on 2017-04-26 between 03:51 and 05:43 UT. Images were taken in burst of 2000 at about 10 frames per second at approximately 10 minute intervals. The best 128 or 256 images from each burst of 2000 were used to create the 13 frames in the animation. The images were made with a Questar 3.5" telescope and a Dankin 2x Barlow lens for an effective focal length of 2700 mm giving a focal ration of f30 with the 89mm Questar. The camera was a ZWO ASI120MC one shot color planetary video camera with images captured using oaCapture running on macOS. The best images in each burst of 2000 were stacked in AutoStakkert!2, deconvolved in Lynkeos, with final crop and exposure adjustments in Photoshop. The animation was generated in Phootshop. Transparency varied during the course of the exposures causing some variation in the quality of the frames. I've included a couple of still images with better resolution than the GIF animations. 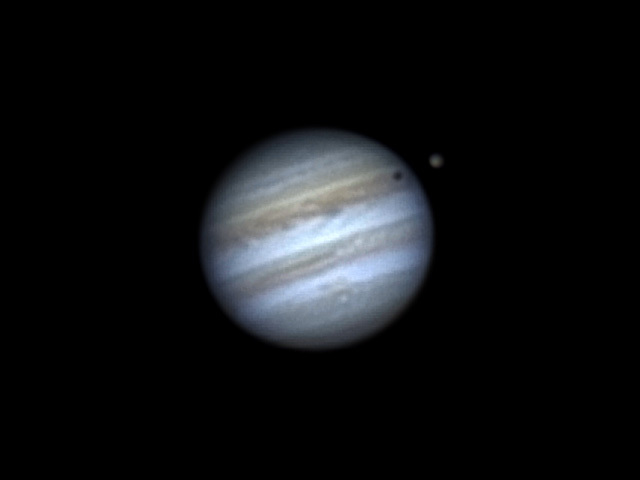 The 11th frame has the best quality showing both Io and its shadow against the surface Jupiter. 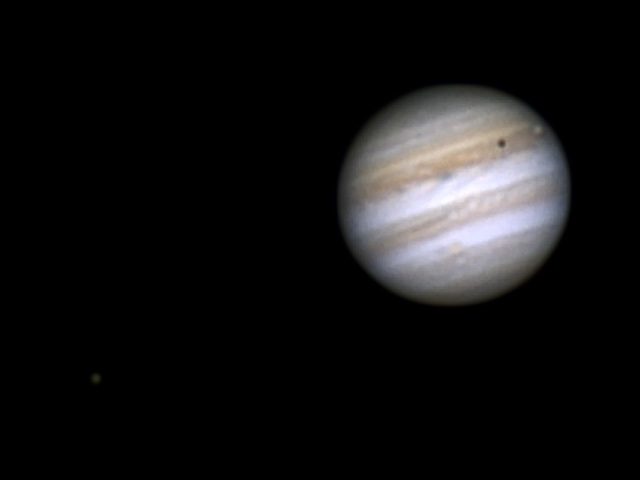 The last frame shows Io's shadow still on Jupiter with Io against the dark sky. The Great Red Spot is barely moving into view on the opposite side of Jupiter's disk. I can see that I'll probably tweak this a bit more. Animations like this are a lot of work - it has taken me two weeks off and on to get to this point and it is time to take a break!